In 2010, as the nation continued to recover from the recession, a dizzying 93 percent of the additional income created in the country that year, compared to 2009 — $288 billion — went to the top 1 percent of taxpayers. 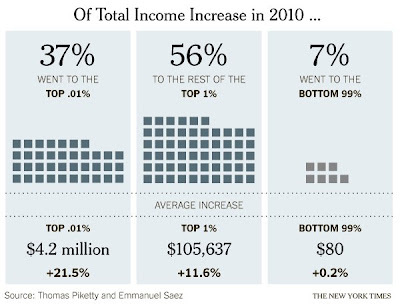 The average income of the vast majority of taxpayers in 2010 was just a smidgen more than the $29,448 average way back in 1966. . . . At the top, the super-rich saw their 2010 average income grow by $4.2 million over 2009 to $23.8 million. Compared to 1966 their income was up on average by $18.7 million per taxpayer. Goodness goodness gracious. Remember (well, you may not) what happened after the Great Depression? You had a huge political realignment, the New Deal, high top tax rates, highly progressive taxation, widespread capital and exchange controls to keep the financial sector in its box. And for a quarter century or so after the Second World War, amid all these interventionist things, we had the Golden Age of capitalism: high and broad-based growth, and falling inequality around the world. This crisis, though, we've seen the banks saved, and no political realignment to speak of. A little bit of wrist-slapping (and higher capital requirements) for the banks, but otherwise relatively little action. The concentrations of wealth, this time around, remain mighty, and there is no sign of anything around that will shrink them.